Recently acquired Google handset manufacturer Motorola Mobility has made public details of a new Qwerty keyboard based phone, with a dedicated Facebook button – known as the Motokey social. 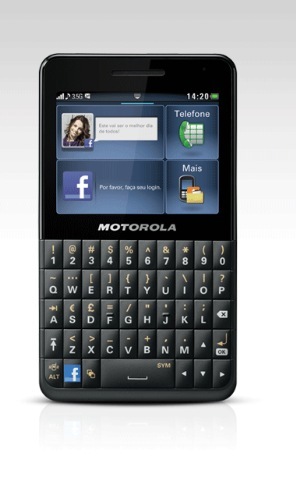 Motorola announced the Motokey social mobile phone on their Canadian website, which is said to contain a slender chassis and with a capacitive touchscreen, a full Qwerty keypad and a dedicated Facebook button. Moto has noted the dedicated Facebook button allows access to the FB account, with sharing of pictures and links, along with keeping in touch with friends from one button alone. The screen shots of the handset also highlight the home screen has quick access to Facebook, Twitter, YouTube, Gmail and Google Search – from a six panel start screen. The Motokey social is just 9.98mm thin and will ship with a 2.4-inch QVGA 320×240 TFT LCD display, with a 3 megapixel camera, 64MB of RAM and 50MB of memory and support for microSD cards. Mobile phones with one touch access to Facebook have been used by HTC, INQ mobile and Vodafone this year alone, in both a Qwerty keyboard format and full touch screen models where the Motokey could also be aimed at the budget market too.